Wow, I guess that's why I'm not in the car business. According to reports tonight, the Cash for Clunkers program went from having $779 million still eligible for funding as of Thursday morning to being overdrawn by Thursday night. That means that roughly 225,000 cars were sold in a DAY (as point of reference that's almost equal to all the cars sold in the US every month)?!?!?! Hmmm, I think somethings not right with that number. My suspicion is that car dealers might have had 3 - 5 applications per day this week and decided to game the system a bit. Maybe they found a loophole where they could file an application for funding with "details to follow". If a dealer had a block of 50-100 clunker applications on file it they would save their space in the line of dealers waiting for the rebates and find customers to file the final applications over the coming months. Like I said, I've read through the red tape associated with this program and it is substantial. I can't believe that 250,000 consumers had eligible vehicles, that were insured/registered (with documentation - just getting DMV registration info can take days) and acceptable credit to buy that many cars in just a couple of days. The markets continue to wind higher on the expectation that things continue to get worse more slowly. However, lots of signs of a top seem to be popping up --- Kudlow and Cramer both calling for new bull markets, Nasdaq acting like it did in Jan 2000 (remind me what happened in the 7 years after Jan 2000? ), etc, etc. File this under "Reasons to focus on MATH!!!" July 28 (Bloomberg) -- Drugmakers may ramp up their push for an overhaul of the U.S. health care system by spending $100 million on ads starting as early as September, said a person familiar with the discussion. " Could they know about a loophole that might lead to higher revenues that would more than offset the sales would lose if they cut the cost of certain drugs? 1) The pharma companies know that this change is coming and want to appear as though they are part of the solution rather than part of the problem. 2) They offer to cut the cost of some medicines over 10 years but don't have to deliver those cost savings because no one will be able to track the "savings"
3) The new health plan will substantially increase the number of insured people in the US. The more people who are insured, the more pharmaceuticals that can be sold by the big pharma companies. The health care debate is mostly a political one and one that I'd rather avoid, but when it crosses into the world of business I feel compelled to comment. * Note: This ad campaign was projected to start in September, but I've seen ads popping up already. As Sammy Hagar said "I can't drive 55!" It's all cars all the time right now in my household so I'm a little obsessed with the issue of cars at the moment (disclosure: I've got an old Suburban that will be put out to pasture and replaced by a new vehicle getting 30mpg+ thanks to the cash for clunker program). 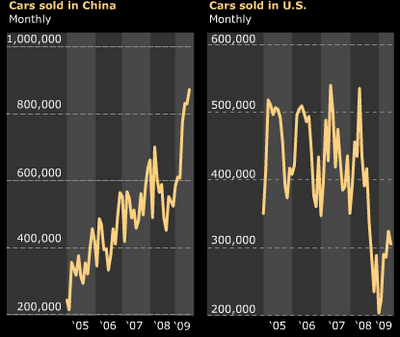 Consider this chart via Bloomberg that shows the discrepancy between unit sales of cars in the US and China in recent years. This is not an entirely accurate representation of the markets because almost half of all vehicle sales in the US are light trucks but the trend is clear - China's market has seen explosive growth while the US has spun it's wheels. Admittedly, the cash for clunkers might provide a small, short term boost but 250k cars is a small piece of a market that buys 10 million to 16 million cars. If I were running GM I'd try to figure out ways to build more cars that appeal to the Chinese market (GM's actually pretty successful in China already but they should try to gain market share). By now you've undoubtedly seen one of the 14,502 different commercials running on TV from the different car companies begging you to trade in your clunker for $4,500 toward a new car!!! I'm particularly bothered by some of the car companies that seem to imply that the rebate is coming from them rather than a government credit. Also, the implication in the ads is that any old car will qualify when the reality is that very, very few cars and trucks will qualify. Here are the details as I know them today courtesy of the government's website - www.cars.gov. *** Note that the final document is a whopping 136 pages of legal nonsense. I'll try to highlight the key items. 1) 1 Year Proof of Insurance. If your insurance card does not cover the entire year preceding the trade in, you will need other proof of insurance. Contact your insurance company to get evidence of 1 year worth of insurance. The form must include, at a minimum, the insurance company, policy number, VIN, start and end date of insurance (showing at least 1 year). Proof of Registration going back at least 1 year. 2) Must have “Clear” title. This means you can't owe anything on the car or truck. So to summarize, you must have an old vehicle that you own free and clear, that had a combined EPA estimate below 18 when new, that is drivable, that is insured, that is registered, and you have to buy a new vehicle that improves your MPG by 10 MPG to qualify for the max rebate. Sounds like it might drive a lot of traffic into dealerships, but I think many consumers will be surprised when they actually get into the details. *Carloads originated on U.S. railroads in June 2009 were down 19.5% (252,078 carloads) from June 2008 to 1,037,928 carloads. June 2009 was the eighth straight double-digit monthly carload decline, but it was a smaller decline than the previous two months. Average weekly carloads in June 2009 (259,482) were 10,311 carloads higher than in May 2009. • For the second quarter of 2009, U.S. rail carloadings were down 22.2% (945,652 carloads); second quarter intermodal traffic was down 18.3% 538,345 trailers and containers). Despite their implication that June's decline was a "smaller decline than the previous two months" I would note that historically June experiences a sharp monthly uptick so June's "slower rate of decline" is likely little more than seasonality. A little closer to home consider the fact that St. Lawrence Seaway traffic has plunged 36% in 2009. "Freight traffic on the St. Lawrence Seaway slumped nearly 36 percent in the first third of the navigation season. The fall would have been worse but for strong shipments of grain to Europe and the Mediterranean. The Canadian and American Seaway corporations reported that traffic through June 30 from season-opening March 31 fell to 9,024,000 metric tons of cargo, down 35.7 percent from 14,045,000 in the period last year." There have been more than a few people questioning the ability of firms like Goldman Sachs to truly be trading so successfully in this environment. This article in the NY Times might explain some of their advantage (although the article doesn't specify Goldman, I think it's implied that all of the big banks are engaging in this sort of trading.). "It is called high-frequency trading — and it is suddenly one of the most talked-about and mysterious forces in the markets. Multiply such trades across thousands of stocks a day, and the profits are substantial. High-frequency traders generated about $21 billion in profits last year, the Tabb Group, a research firm, estimates. " The market continues to show remarkable "headline strength". When I opened up my laptop this afternoon every financial website was screaming "DOW PASSES 9,000", "STOCKS AT HIGHEST LEVEL IN 8 MONTHS!! ", etc. Company A is growing a 50% a year and hiring like madmen. They are expanding in China and India and as a result of this growth their earnings were 2% below analyst expectations. Company B has cut 30% of its staff and shut 10 plants in the past year. They are looking at more closings in 2009 and 2010. They "beat expectations" by 3% in the second quarter. Which stock do you want to buy for the long haul? Right now the market is loading up on Company B's stock and that should scare us all. "Who needs earnings in this casino barely disguised as a market? Nobody’s investing anymore anyway. It’s all just numbers going up and down with no real meaning behind any of them"
"The U.S. recession may not be coming to an end and there is a risk the economy may experience a “double-dip” contraction, said Martin Feldstein, a professor of economics at Harvard University. The economy could “flatten out” or “even be positive” in the third quarter, and then it’s likely to contract again in the last three months of the year as the effects of the federal stimulus program wear off and companies finish rebuilding inventories, he said. “There isn’t going to be enough to sustain a really solid recovery,” he said, even though recent data has provided some “good news” on the economy." PS - I'm going to touch base on the cash for clunkers deal again tomorrow, there's too much misinformation floating around about this program (who would think car dealers might be a little less than forthright?). Well, it's pretty easy to be optimistic when you're looking at the biggest bonus pool in the history of Wall Street. I hate to join the list of Goldman bashers because it is starting to attract the lunatic fringe, but the irony of Goldman upping their outlook for the markets after heavily investing in the US markets is not lost on me. This would be like me cornering the market in first edition Beanie Babies and then forecasting that the price would rise by year-end. However, the chorus of "Rally, Rally, Rally" has been growing all week despite what I view as weak operating results from the majority of companies (admittedly a few financial firms have given us the "things are declining at a slower pace" line again). Jim Cramer - the Clown Prince of retail investors - has been getting revved up lately and that's usually good for another 5% run :). I think the voodoo masters - I mean technicians - continue to rule the day and now that we've surpassed 950 on the S&P there is a good chance we could go higher. However, we've been in this vicinity at least 4 different times in the past 8 months and the market has failed to go higher every time. I took a little breather last week, but the markets roared back to life on back of Goldman's tremendous trading revenue. It's important to note that Goldman (and any of the other big trading desks) are making massive profits off swings in the markets not any meaningful change in the economy. We'll see if people continue to chase this rally or if it stalls when non-financial companies start to report earnings. "All the major sources of state tax revenue — sales taxes, personal income taxes and corporate income taxes — took serious blows, the report found. As more people lost their jobs, took pay cuts or worked fewer hours, personal income tax collections fell 17.5 percent in the quarter. Weak retail sales sent sales tax collections down 8.3 percent. Corporate income tax collections, which are often highly variable, declined 18.8 percent. As bad as the first quarter was, the second quarter is shaping up to be even worse, the report said. Preliminary data for the first two months of the quarter, April and May, collected from 45 states, indicated that tax revenues declined by 20 percent compared with the same period last year. That will force states — many of which are already raising taxes or fees, resorting to layoffs or furloughing employees — to come up with more ways to raise or save money." The long-term prospects for NYS are not particularly bright, but the near-term outlook is painful. Can you imagine the rocket scientists in Albany trying to make a balanced decision on layoffs vs. tax hikes vs. spending cuts? Well, it should make for interesting TV. Unemployment math - There's going to be some skewing of the unemployment data over the next three months and I want all of my readers to be aware of the trend so that you won't fall for the headline when it hits the wire. The number of people unemployed that are about to have their benefits expire could hit 500k to 1.5 million before the end of the year. These people will disappear from the unemployment survey and some might try to spin this news as an indication of labor markets improving. While this is not the case, I won't be surprised if someone tries to package this as "good news". Finally, this is totally unrelated to the markets but I think you might enjoy a laugh at my expense. I've had precious few moments to enjoy one of my real passions this year - fishing on the St. Lawrence. Tonight the wind was finally dying down and I decided to give it the old college try now that the water has warmed and the bass have moved into some local hotspots near Clayton. I decided not to take out my fishing boat because I expected to make it a quick trip and I didn't expect to go more than a half mile from my house (mistake #1). After traveling about 100 ft, I could tell that my trolling motor battery did not have an adequate charge to fight the wind so I dropped anchor at a nearby shoal. On my first cast I hooked a decent fish that was pulling drag so I was thrilled..... until I saw it roll over and I realized I'd hooked a giant channel catfish without any pliers or hook removers in the boat (mistake #2). I made one feeble attempt to remove the lure by hand and was rewarded with a one inch gash in my index finger (mistake #3). I eventually fished my pole out of the river, limped my way back to the dock and released the fish unharmed (I wish I could say the same for my left finger - my concert piano days may be over). So, when you're having a rough day back at work after a long vacation (welcome back Mom!) just think "hey, it could be worse, I could be fishing" :). Distressed Commercial Real Estate has soared so far in 2009 and this has come as a shock to some people. "Commercial properties in the U.S. valued at more than $108 billion are now in default, foreclosure or bankruptcy, almost double than at the start of the year, Real Capital Analytics Inc. said. There were 5,315 buildings in financial distress at the end of June, the New York-based real estate research firm said in a report issued today. That’s more than twice the number of troubled properties at the end of 2008. Hotels and retail properties are among the most “problematic” assets following bankruptcy filings by mall owner General Growth Properties Inc. and Extended Stay America Inc., according to the report. The scarcity of credit is causing property defaults in all regions and among every investor type, Real Capital said." I'm a little surprised by the rate of deterioration (doubling in the first 6mths of 2009) but there is no doubt the US has a dramatic excess supply of commercial real estate and it's going to take many, many years to work off this excess inventory. As it relates to Upstate NY think about the two most problematic areas mentioned in the article - hotels and retail. Just about every new commercial property in Jefferson County in the past 4 years has been hotel or retail. I don't think I'd want to hold the loans on some of those properties. I hate to see the discussion about our nation's financial condition deteriorate into partisan bickering, but that apparently is the nature of the beast. I will note that the GAO report on the stimulus echoed my early concern that the stimulus wasn't really stimulating anything, rather it was being used to maintain the status quo. "The report released Wednesday by the Government Accountability Office, Congress' investigative arm, found that the $787 billion stimulus package is being used to "cushion" state budgets, prevent teacher layoffs, make more Medicaid payments and head off other fiscal problems." "For example, the GAO said about half the money set aside for road and bridge repairs is being used to repave highways, rather than build new infrastructure. And state officials aren't steering the money toward counties that need jobs the most, auditors found." Anyone that has driven along a major interstate right now is aware of the substantial "repaving of America" that is underway. The problem with spending the stimulus money to plug gaps in state budgets is that it assumes state revenues will bounce back soon. However, as we continue to see from California to Massachusetts, tax revenues continue to come in below even the most pessimistic assumptions. This means big cuts in services and state jobs in 2010 or another round of stimulus (however, they'd be smart to call it something other than stimulus - call it what it is - emergency aid to states). * Robert Hormats, Vice Chairman of Goldman Sachs, is to be installed as Under Secretary of Economics, Business, and Agricultural Affairs. • Michael Froman, Citigroup, Deputy National Security Adviser for International Economic Affairs. Froman was formerly Chief of Staff to Robert Rubin at Treasury, before following him to Citi. • Froman’s deputy, David Lipton, ran Citi’s global country risk management effort. • Neal Wolin, President and COO, Hartford Insurance Company, Property and Casualty Group now Deputy Treasury Secretary (Hartford received $3.4 billion in TARP funds). The tinfoil hat crowd will notice a couple of names pop up frequently - Citi and Goldman. Well, the sun finally decided to make a cameo appearance in Upstate NY and everyone's feeling better. While, I'm on the subject of weather, I've got a question that I'd love to have someone clarify. When the local weatherperson says today's high will be 68 degrees, well below our average for this date of 81... do they really mean AVERAGE or do they really mean NORMAL? I suspect that it's really a normal temperature for a given date because our departure from AVERAGE every day is so substantial that eventually our average would start showing some real fluctuations. Swedish Banks now want customers to pay for the privilege of holding their money. Well, about a year ago I joked that it wouldn't surprise me if we continue along our current path that punishes savers and rewards those that are leveraged to their eyeballs, if banks started charging you for the privilege of holding your money. The decision on the repo rate will apply with effect from Wednesday, 8 July. The deposit rate is at the same time cut to -0.25 per cent and the lending rate to 0.75 per cent." That's not a misprint. Instead of paying interest on deposits, Swedish depositors will now PAY their banks 0.25% per year. Those banks might deserve to get a Jimmy Stewart style run on their deposits tomorrow. Congress is pushing for another short-selling ban. Short sellers are not bad people. In fact, they are often the best educated investors in the market because they look through all of the happy, sunshine talk and delve into the reality of a business. Most 401k's would look better today if more short-sellers had been on CNBC in 2007 and 2008. A market without short selling is a rigged game designed to have one outcome. At a time when investors around the globe are getting increasingly nervous about their US holdings this sort of move might push global investors to reallocate assets elsewhere. Also, it should be noted that short-selling puts a floor in stock prices and often stops rapid stock price swings like the ones we saw last October when a short-selling ban was in effect. "Officials in some states say their property tax revenue is falling for the first time since World War II. But officials across the country say there is no question that the number of appeals has risen from the usual trickle to a flood." The most likely scenario is that municipalities will lower assessments and raise tax rates to offset the change. It won't be popular, but once one town cracks and raises taxes it will spread through a county faster than the H1N1 virus. If you get a chance to catch a repeat of the Pete Peterson interview on Charlie Rose sometime it's valuable use of your time. Mr. Peterson has embarked on a campaign to change our habit of running perpetual consumer and federal deficit. I hope to be able to stay as informed on the global economy as Mr. Peterson when I grow up. A couple of blogs have picked up on a post written by a US Appeals Court judge last week. In essence, the idea is to give news outlets exclusive rights to their stories without allowing linking from other news aggreators (think Drudge or locally our own Newzjunky). I meant to throw up these photos the other day, but it got lost in a pile of housing and jobs data. 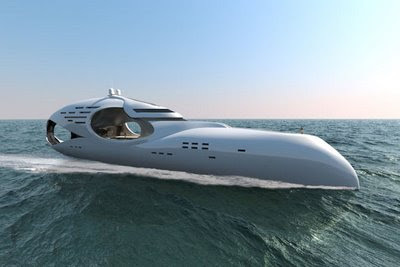 I was in the market for a nice 12 foot aluminum boat or maybe a sailfish sailboat until this concept boat caught my eye. 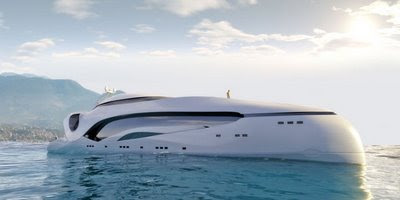 I love the fact that with a 250 ft yacht in the middle of the greatest body of water on the planet, this boat needs a pool on the main deck. 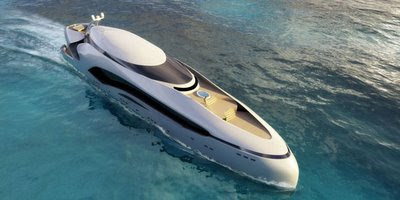 Just in case 250 fee doesn't quite meet your needs, this 300 foot prototype should fit the bill.